Our SLOW blend features a sweet, bright and calming mixture of fennel, basil and orange essential oils. Today we’re going to take a quick look at Fennel, which is responsible for its subtle, comforting sweetness. Fennel shares a similar licorice-like flavor profile with Anise and is a member of the carrot family (who knew?). Though they look unassuming, fennel seeds are intensely aromatic and are quickly identifiable. Fennel seeds are often used in mediterranean and middle-eastern spice blends to balance heat with sweetness. We also employ fennel to bring balance to our SLOW blend, as it helps bridge the divide between the sharpness of orange citrus and the intense cooling sensation of basil. embarrassing conditions like constipation or indigestion dig into your mood. By assisting in the digestive process, Fennel helps ensure that you’re not burdened by the feeling of bloatedness throughout the day. Although a healthy digestive tract is a great first step to relaxation, another key to a good mood is mental clarity, and in that Fennel is a key player. Fennel is packed with potassium, which is an electrolyte. Although electrolyte fluids are often marketed towards athletes, they are beneficial to everyone. Electrolytes help to conduct electricity throughout the nervous system of the body. And because the brain is essentially just the insanely complex relay station that acts as the nervous system’s hub, this greatly aids your ability to be decisive in thought and action. 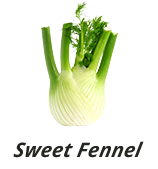 Fennel is an integral part in our strategy to bring you the calm you seek, but it doesn’t act alone. Orange, Basil and precise Cannabis extracts all aid in delivering to you calm and clarity. Sign up for our Newsletter to learn more about our products and how they can help set your pace.